He and the Petersons became close enough that at his invitation some of them visited the The Godfather set. The family and the actor have kept in touch all these years and some have visited Duvall’s Virginia farm. 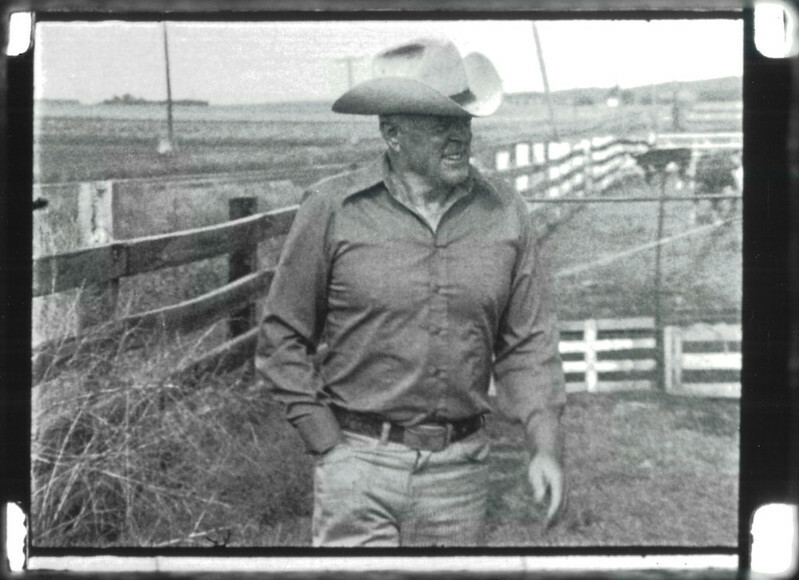 On one of Duvall’s visits to Nebraska the Petersons introduced him to the Haythorns and the true-life stories of that family’s early, epic cattle drives became the inspiration for Duvall’s mini-series Broken Trail. Meanwhile, Caan sufficiently learned the ropes from working alongside the Haythorns and their hired hands to become a professional rodeo competitor, an activity the suits in Hollywood increasingly frowned on as his career exploded. None of it may have happened if that band of filmmaking gypsies hadn’t come west. Their presence certainly got the attention of the locals while it lasted but no one could have predicted the Coppola production would lead, at least indirectly, to other films and deeper connections that played out over several years. It’s hard to imagine how else Duvall would have happened upon the Petersons as the subjects for a film. The man responsible for bringing Duvall to Nebraska, Coppola, was a fish-out-of-water here. His parents were musicians and he grew up in urban Detroit and Queens, New York, immersed in a life of art, literature, theater and the movies. The Hofstra theater arts grad entered UCLA’s fledgling film studies program, where his work soon attracted the attention of Hollywood. At the time he made Rain People he was finding his way at Warner Brothers. Like all the major Hollywood studios then, Warners struggled adapting to changing audience tastes and escalating production costs and began entrusting young upstarts like Coppola with productions traditionally assigned old veterans. While directing Finian’s Rainbow for Warners-Seven Arts Coppola met Lucas, a Modesto, Calif. native and USC film school product. Eager to break from studio constraints and make their own personal art films, the two were kindred spirits, When Coppola enlisted a small band of like-minded artists for Rain People, Lucas was a natural choice. The experience of making that film convinced them to launch American Zoetrope, a counter-culture answer to the old studio system that like United Artists decades before put the creatives in charge of production. The studio’s first two projects were the Lucas written and directed films THX-1138 and American Graffiti. The producing partners parted ways in the mid-’70s. But for a magical time the career arcs of these and other cinema stalwarts intersected to produce some of the most satisfying collaborations of the 1970s. As fate would have it a crucial part of that intersection unfolded in rural Nebraska among area denizens whose rough-and-tumble work-a-day lives were far removed from the distorted, make-believe reality of Hollywood. Lucas’ making-of doc about the experience records it for posterity. Situated just below the southeast corner of the Nebraska Panhandle, Ogallala was about the last place you’d expect to find a gathering of the soon-to-be New Kings of Hollywood. But that’s exactly what transpired. 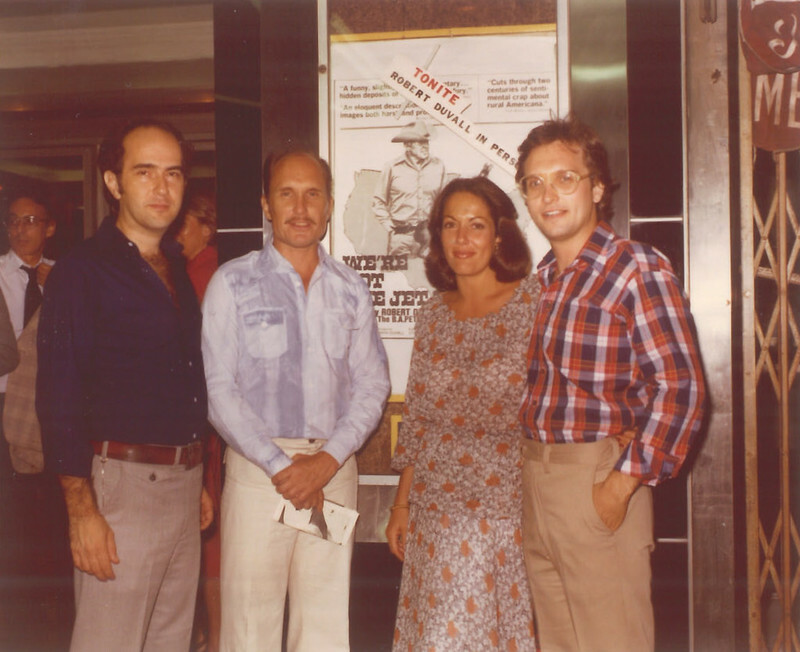 This is the story of how those connections led Duvall to make We’re Not the Jet Set, an underseen film that may be getting new life courtesy of art cinemas. I was a burgeoning film buff in 1974 when the Omaha World-Herald‘s now defunct Magazine of the Midlands ran a piece on a documentary film that Robert Duvall, who had recently gained acclaim for his work in the first two Godfather films, was directing in Ogallala, Neb. about a ranch-rodeo family there, the Petersons. 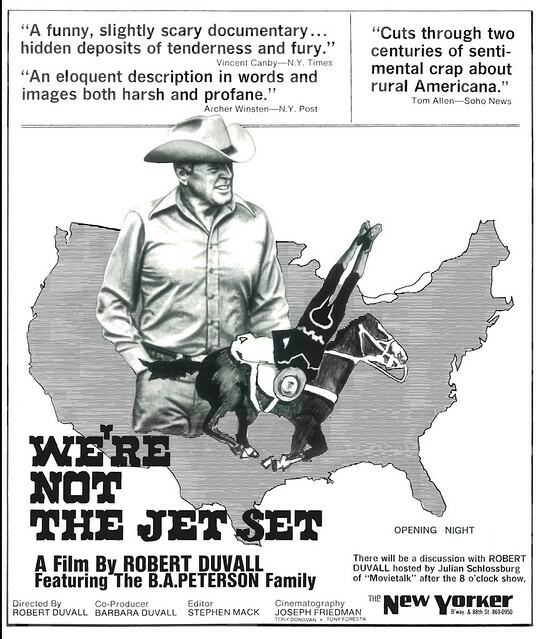 The film, entitled We’re Not the Jet Set (1977), sounded promising enough but what really got my attention was the fact that Duvall only came to meet the Petersons and to make his film about them as a result of coming to Nebraska a half-dozen years earlier for a few weeks work on the art road movie, The Rain People (1969), a film written and directed by Francis Ford Coppola and assisted by George Lucas. Rain People starred Shirley Knight and co-starred James Caan and Duvall. The Petersons had a horse pen just across from the motel the cast and crew stayed at and Duvall and Caan got to know the family by riding some of their horses. Duvall became so intrigued with this colorful clan that he returned again and again to immerse himself in their life and to shoot the documentary. It was the actor’s first directorial effort of what’s turned out to be a distinguished body of work as a director (Angelo My Love, The Apostle, Assassination Tango). What most struck me then and now is how these figures, who at the time were obscure, except for Knight, would in a few years come to be major players in Hollywood. I loved the fact that they converged in the middle of nowhere for a small film that led to another film. And as I’ve come to find out, the experience of making these films in rural Nebraska led to enduring relationships and collaborations and the inspiration for yet another film. 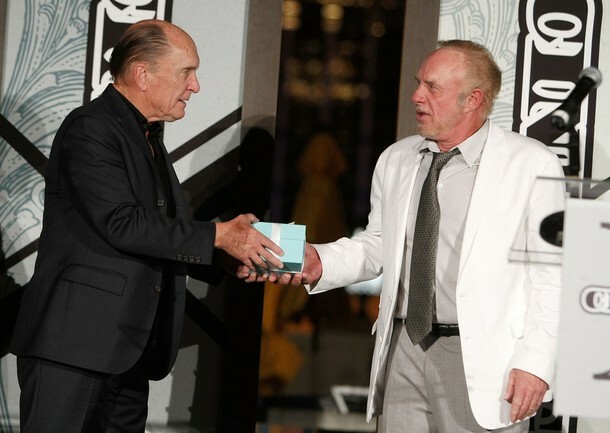 For example, Duvall and Caan have stayed in contact with the Petersons, several of whom have wound up in the film industry as wranglers, trainers, and stunt riders. And it was through the Petersons that Caan and Duvall met a more prominent ranch family, the Haythorns, and the actors’ interactions with them led to Caan becoming a professional rodeo competitor and to informing Duvall’s later Western mini-series Broken Trail. Jet Set was released in 1977 to mostly strong reviews from its featured screenings at film festivals, in select art house cinemas, and on public television. Since then the film has pretty much been unseen. There are reasons for that. As I have come to find out, its virtual disappearance from the market is a real travesty because the work stands with the best docs from that era. As it happened, I saw Rain People well before seeing Jet Set, a film that until a few years ago only existed for me in terms of the few write-ups I’d found about it. When I finally decided in 2010 to develop a story about all of this, including the connections and relationships around the films, I contacted Duvall’s then-production company, Butcher’s Run, and they were nice enough to both send me a DVD of the pic and to arrange an interview with Duvall himself. Jet Set was a real revelation for me. It’s a superb example of cinema verite filmmaking and it comes as close to pure cinema as any film, dramatic or documentary, that I’ve seen from that era, and I’ve seen a lot. Duvall led me to his good friend Caan, whom I also interviewed. I also got in touch with several of the Petersons and interviewed them as well. Since then I’ve interviewed some more of the principals behind Jet Set, notably cinematographer Joseph Friedman and editor Stephen Mack. I subsequently secured interviews with Knight, Coppola and Rain People cinematographer Bill Butler. But I’m getting ahead of myself. For years, decades really, that Herald story about the film I referred to earlier stuck in my mind. It gnawed at me all the while I worked as a film programmer and publicist in Omaha and then when I transitioned into freelance journalism. In the era before the Internet it was hard to find much reference to the film. It certainly wasn’t available for rental through any distributor I ever came upon. The last 15 years or so I’ve consistently looked for opportunities to write about film and this blog is a good showcase for the many film stories I’ve filed. The story of Rain People and Jet Set is one I longed to tell. Since leaving the film programming world in the early 1990s I also longed to organize some film event. Now I am combining the two longings in one project. My in-progress story is slated to be published in some Nebraska publications and I’m working with the publisher of The Reader (www.thereader.com) and the director of the Omaha art cinema Film Streams on possible screenings and other events related to my story. I have all the interviews I need for the piece. The only player in this story I have not able to connect with is George Lucas. i will try again but the story does not depend on his participation. My main purpose with all this is to bring this story to light and to help revive interest in these films, particularly We’re Not the Jet Set. Recently, Turner Classic Movies added The Rain People to its rotating gallery of films shown on the cable network. But Jet Set remains inaccessible. I would also like to see the Lucas documentary, The Making of the Rain People, revived since it is a portrait of the early Coppola and his methods a full decade before his wife Eleanor shot the documentary Hearts of Darkness about the anguished making of Apocalypse Now. The story I’m telling is also an interesting time capsule at a moment in film history when brash young figures like Coppola, Lucas, Duvall, and Caan were part of the vanguard for the New Hollywood and the creative freedom that artists sought and won. Editor’s Note: As I further develop the story, I’ll be making more posts. And when screenings and other events are scheduled in conjunction with the story, I’ll be sure to post that info as well. I’m posting my interviews with all the key figures in this story-event project.